Theatrically Speaking: What Have They Done? The person pictured has nothing to do with the upcoming review. Yesterday it was finally the time to fly to Sweden to check out what our dear neighbours can do with the world's most popular musical. I had read one review by a fellow Mizzie beforehand. I tried to keep everything said there out of my mind, but I'm afraid some of the thoughts were in the back of my head. More importantly, as I'm certain everyone who's met me knows, my love for Åbo Svenska Teater's production of Les Mis knows no borders. The Malmö production even being in the same language than ÅST's Les Mis... It felt a bit like I was going to see an ice hockey game - the other team might be good, but my team has to be better. Silly, I know! Despite all this, I'll try my best to remain as objective as I possibly can and avoid unnecessary comparisons to other productions. First of all, keep in mind that Malmö's Les Mis is a true non-replica version. There's a lot of symbolism, the costumes and sets have been separated from the 19th century setting... I'll talk about this more later, just keep it in mind while reading. I'll go through the actors first and then say a couple of words about the production. I'll start with my most negative remarks and work my way towards the highlights of the evening. Sadly, the performance I liked the least was the star of the show himself, Dan Ekborg as Jean Valjean. His Valjean felt, to me, very unpleasant. I won't try to claim his singing wasn't acceptable - the tone of his voice wasn't to my tastes, but he hit the notes well enough. The problems had to do with his acting. 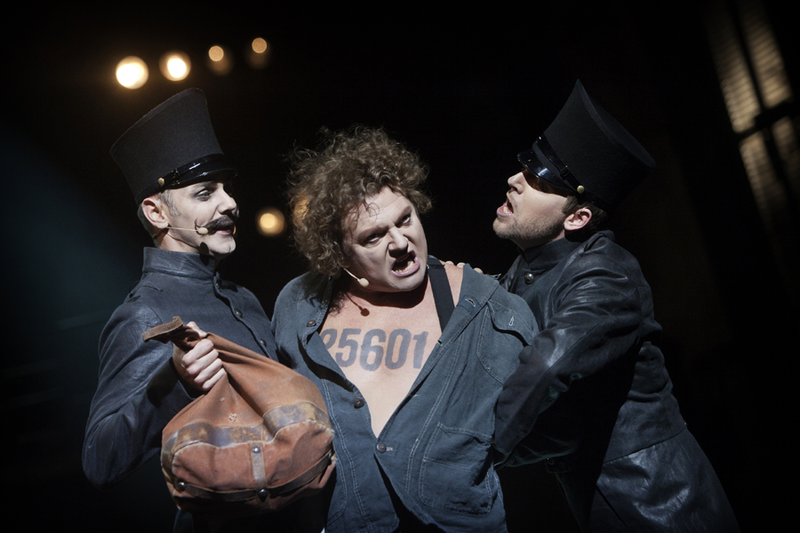 At first, his Valjean-is-a-criminal-hardened-by-the-prison approach intrigued me... But as the show progressed and I couldn't see the better person surfacing in him, I lost my good mood. 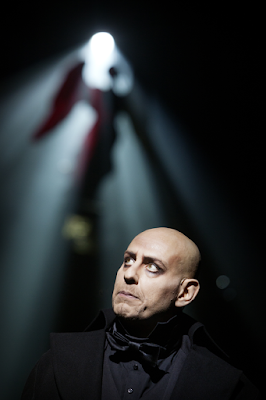 Ekborg explains his take of the character in an interview in the show's programme. He doesn't see Jean Valjean becoming fully good, and he for example thinks Valjean himself benefits the most, becoming the owner of the factory (or, as Ekborg puts it, a place of slavery). Apparently, this Valjean is not one to give money to the poor... His lack of charity is also visible in the performance - I don't think I've ever seen Valjean being quite so cold towards Fantine or treating Cosette like a responsibility like that... While the unique approach is, most certainly, very interesting, I'm afraid it'd be better left in the hands of some other actor than Ekborg. This performance just felt unpleasant to me. Another character that really didn't grow on me was Enjolras. I'm not one to demand complete accuracy to Victor Hugo's novel (even though I do think it'd be nice! ), and at first I thought Anders Gjønnes's Enjolras was simply a prime example of Umm?jolras - until he really lost it by the second act. The unremarkable but also unannoying waving the flag was replaced by pacing around, shouting orders and pacing and shouting some more. And you're supposed to believe these students are following this nervous wreck to their deaths? 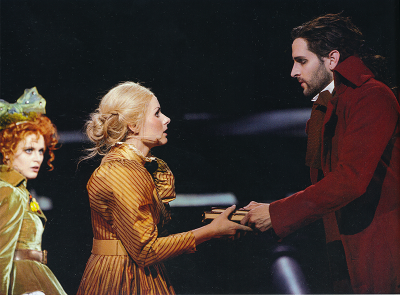 Notable inhabitants of Hohumville were Cosette, Marius and Thénardier. Apart from perhaps the most powerful rendition of Empty Chairs at Empty Tables I have ever heard, Philip Jalmelid's Marius was rather uninteresting. There just wasn't too much character development or interesting detail to see there. Same goes with Cosette, Mathilda Ahnell - a pretty voice, but acting-wise she blended nicely to the sets. Sadly, even the chemistry in between Marius and Cosette was quite lacking. I mean, shaking hands? Really..? Their scenes didn't make me smile much, as they often do with other productions. I've complained before that in ÅST Marius and Éponine have too much chemistry. In Malmö it went to the other extreme. Ida Högberg's Éponine was quite good, her On My Own excellent - and her interaction with Marius next to nonexistant. Marius holding her while he dies and speaking loving words to her to her was stretching it since they hardly seemed friends before that. Thénardier, portrayed by Peter Harryson, can be summed up shortly: boring. I really disliked Matt Lucas as Thénardier because he only played the part for laughs... But he, at the very least, played it for something. Harryson wasn't funny, or vile, or anything really. He mostly just stood there and sung. Madame Thénardier, Evamaria Björk, then again, did a good job with the part and was way more energetic than the master of the house himself - she even helped him rob bodies in the sewers. Karolin Funke as Fantine wasn't bad either. She sung I Dreamed a Dream quite nicely... But the direction of the production made it difficult to see the suffering woman in her. When it came to the point where Fantine starts selling herself, she didn't as much as open one button of her blouse. You couldn't see her descent having any physical effects on her, apart from losing her hair - and that made the character a lot less impactful. The first true rays of sunshine is this cloud of mediocre were the child actors, Beata Ljunggren as little Cosette and Ivar Lodén Håkansson as Gavroche. The both sung excellently and acted with more energy than some of their grown-up co-stars... Kudos to them! Sadly, I can't find any pictures of Grantaire. To me, the second-biggest highlight of the whole performance was Glenn Daniel Nilsson as Grantaire. I was really interested in seeing his version of the character since he was Marius in ÅST last season and I really admired his performance in that role. I have to admit whenever he was onstage - as the foreman, sailor #1, second drunk from the left in Master of the House... My eyes were fixed on him. But to Grantaire! As you may know, I have a soft spot for Enjolras/Grantaire interaction, and the production closest to my heart is lacking in that aspect. So, I was curious to see if anything was different here - and luckily Nilsson didn't disappoint. His Grantaire truely only had eyes for Enjolras. The director or the actor apparently agreed with what many of the fans already think about this character! The Enjolras & Grantaire fan part of the audience - namely, me? - was rewarded, apart from Grantaire's obvious adoration, with a moment during Drink With Me: Grantaire grasped Enjolras's arm and pleaded him to "drick med mig", only to be pushed aside. Other than that, Grantaire refused to fight, drank a lot and was a loving big brother to Gavroche. He even caught the smallest revolutionary when he fell to his death - and died himself with Gavroche's body still in his arms. Definitely touching. But the true star of the night, the performance deserving a standing ovation, was Fred Johanson's Javert. Sören, Earl, make way, my list of best Javerts ever just got longer! If Ekborg's interview showcases a very unique understanding of the character, Johanson's quotes tell that he's truely done his homework and studied Victor Hugo's novel. His Javert was the most book-accurate one I remember seeing. Johanson's voice was a pleasure to listen to, deep and gorgeous. His Stars was a treat, and his Suicide is one of the few times I remember seeing the scene applauded - perfectly deservedly. I've never seen the broken man Javert becomes more clearly than last night. If the Thénardiers weren't quite on the same level, this Valjean/Javert pair was even more uneven. If only Johanson's Javert could be seen with a better Jean Valjean... The combination would be mind-blowingly good! From the Brick-accurate little smiles every now and then to the gorgeous low notes, I enjoyed every single second of Johanson's Javert. When he and Glenn Daniel Nilsson were onstage at the same time during the barricade scenes, I really didn't know who to watch! Sadly, that wasn't enough to truely save the production. I left the theatre with an unpleasant feeling I've never associated with Les Mis before. It wasn't all the actors' fault - I think the production itself, directed by Ronny Danielsson, stopped the watcher from getting too deep into the events and from feeling too much for the characters with all its modern staging choices. I also liked Annsofi Nyberg's costuming. Mostly, it looked great. I think that the biggest problem was putting all the students in similar outfits, tricoloured pants and red jackets. When Enjolras didn't really separate from the crowd acting-wise, everybody looking like him surely didn't help making him a recognisable figure... But other than that, the costumes were nice to look at. The action scenes, The Runaway Cart and then the barricade, were a bit of a mess. 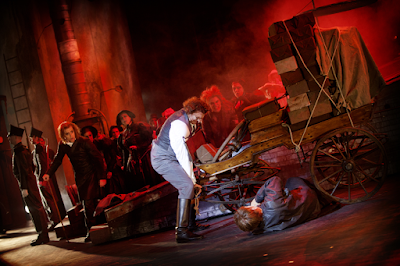 The abstractness of the barricade made portraying shooting and fighting hard, and as a whole the production trusted the power of light, smoke and noise way too much, with the actors hardly bothering moving around the stage in action scenes. Some other confusing barricade-related bits were the students dying twice - rather awkward, jumping from the barricade to downstage like that! - and the burning French flag seen in Final Battle. Someone clearly missed the point, putting that there. The both sides of the battle fight for France, so who set the flag on fire? If only they had used the red revolutionary flag, then the idea might've worked! The Finale had both good and bad moments. Only Fantine showed up to welcome Jean Valjean to heaven. This doesn't have to be a problem, since the necessity of Éponine's part can be debated - but since we still heard Éponine's voice but only saw Fantine, the effect was confusing. The good part was that Javert also had a part in the Do You Hear The People Sing reprise. Here in Nordic countries, our theatres understand where his character belongs! The Malmö Finale's end was quite perfect actually, because, unlike in ÅST, the Thénardiers weren't nowhere to be seen. The show was heavily choreographed. The effect varied from stunning to awkward. Even though some scenes looked good, I missed the standard blocking a bit - with a tight coreography, there's no room for inprovised background action in ensemble scenes! Finally, the orchestra. Personally, I'm a fan of the new orchestrations à la Live! 2010 or Dutch 2008, so this version, sounding more traditional with synthetizers and such, wasn't exactly to my tastes. The music still sounded great though, grander that I've heard it played before, with a big orchestra conducted by Mats Rondin. I know I may appear overly negative here. After all, everybody sung well, and there clearly was a lot of effort put into the show. The part of my company who hadn't seen Les Mis before said she enjoyed the show, and I'm sure the production will find its fans. This has just been the two cents of an overly invested Mizzie who, for the first time, left a theatre after seeing Les Mis without smiling. Maybe this is just boredom, seeing the ÅST production so often lately... I'll see it again in four days. If it turns out then I'm tired of it too, I shall update this entry to give Malmö an absolution. Picture credits: the first photo is mine, the one with Cosette, Marius and Éponine as well as the one with Glenn Daniel Nilsson are from the production's programme, the rest are by Malin Arnesson from Malmö Opera's press photo page. I was really relived after I read the part about the actors, because as you know it's almost exactly what I think! I seriously luahged out loud reading that about Peter Harrysona dn Matt Lucas, 'But he, at the very least, played it for something'. SO TRUE! You know what, to be honest I actually disliked this production ALOT the first time seeing it, but I never really admitted it to myself because I love the general musical (and the book) so much. 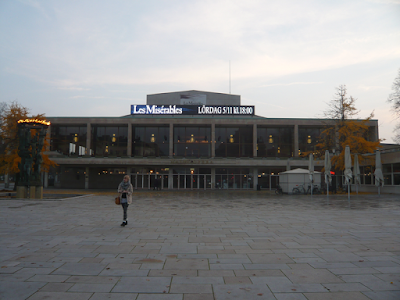 So I really know what you mean with, 'for the first time, left a theatre after seeing Les Mis without smiling.' yes, I've only seen the WE one, but each time I've seen it I've always been esctatic afterwards because it is THAT good. Argh, I hate when it does that!! But I actually still think a modernisation of Les Mis could work somehow - if only every actor was as amazing as Johanson here, then this could be so much better! A reply some hundred years late: "When he and Glenn Daniel Nilsson were onstage at the same time during the barricade scenes, I really didn't know who to watch!" I agree. Nilsson and Johanson were absolutely fantastic and I will never forget them. I absolutely adored Les Misérables in Malmö, so I disagree with you on some points (although I wasn't very fond of Harryson's Thenardier either) but I really enjoyed reading this review. Very well-written. I can understand people really liking this production: now, after over a year, I still remember the visuals very clearly – so it was a very memorable experience for me too. I definitely don't regret going to see it, even though all parts weren't for my tastes.